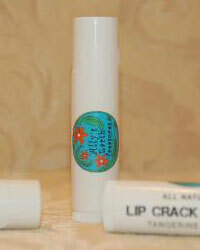 Take care of dry, flaky and cracked skin with this all natural, non-petroleum lip balm. Let it moisturize, nourish, and protect your lips from the elements as well as free radical damage. It tastes good, too, making your lips very kissable. Ingredients: coconut oil, beeswax, vitamin e, and essential oil.